Have you been planning to propose to your crush but don't know how to do it properly. 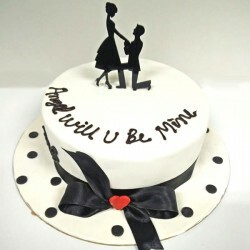 Well, propose to that person in the best way by sending propose day cake online from Giftjaipur. The romantic cake purchased from Giftjaipur will do the magic for you. When you make a propose of love, you make sure you keep it forever. To embellish your propose with the soft and warm adornments, Giftjaipur brings you a wide collection of propose day gifts online. You will find the most innovative gifts for Propose day only at Giftjaipur. We have beautiful bunch of aromatic flowers be it Roses, Orchids, Gerberas or Carnations to adore your lover because there is no better way than flowers to propose the love of your life. You can choose through our wide collection of valentine flowers and cake combos online. The best thing of ordering a gift from Giftjaipur is that you can enjoy an impeccable delivery service which you may not find anywhere else. •	Make your loved one realize the sweetness of your love with delicious chocolates or a mouth-watering cake.